Making sure you have a solid backup strategy for you Windows 10 computer is one of the most important tasks that few people remember to do. Making sure you have a solid backup strategy for your Windows 10 computer is one of the most important tasks that few people remember to do. In earlier versions of Windows, its backup utilities left a lot to be desired, and a third-party backup program was usually your best bet. However, Windows has evolved, and today Windows 10 has new built-in tools that make it simple to have backups of your photos, documents, and other sensitive data. File History is a feature first introduced in Windows 8 and is similar to Apple’s Time Machine in OS X. It’s the perfect choice if you want to ensure that files you often make changes to like spreadsheets and Word documents are backed up regularly. File History monitors the files in your folder for changes and automatically backs them up when they are modified. It’s turned off by default, but it takes just a click to flip it on and to configure it is easy, too. To use it, you’ll need a large capacity external hard drive or a USB flash drive. You can set it up to use a network location, too. In addition to your most valuable data, File History will automatically back up your Favorites, Contacts, and Desktop items, and more. Some of you might already be familiar with this one. Creating a system image toolset was also available in Windows 7. Even with File History enabled, it’s a good idea to create a system image using the Backup and Restore feature because redundancy is the name of the game when it comes to backups. A system image has a couple of advantages. If your drive were to fail, you can use it to get up and running quickly. And, you can use it to upgrade to a new drive without the need to reinstall apps, settings, and files. Windows 10 comes with its cloud-based backup service OneDrive built-in. It’s integrated deep within Windows 10 and Microsoft Office 365 will backup and store your spreadsheets, PowerPoints, Word, and other Office documents by default. You can change that if you want, but it ensures your work is backed up and accessible from anywhere. Also, if you have an Android or iPhone, you can set it to automatically back up your photos to OneDrive. Another essential aspect of your PC backup strategy is to establish an off-site backup service. There are quality services you can use like Carbonite, BackBlaze, or our favorite, CrashPlan. You do need to pay an annual fee to use off-site storage services, but we highly recommend adding this to your arsenal. The best part is they once you have them set up, they just run in the background, and you can forget about it. Again, we can’t stress enough how important backing up your data is, whether it’s your phone, tablet, or PC. Luckily, Windows 10 makes the process a simple affair and every computer owner needs a robust backup strategy. What’s your backup strategy? Leave a comment below and let us know. And for more in-depth discussions about Windows 10 backup options, join our free new and improved Windows 10 Forums. Max name of a file to be backed-up is just over 200 characters, and maybe, depending on your choice of user and PC name, as low as 160. FileHistory does not warn you when it fails to backup a file, or if it decides to just stop working. Backup access is via a link on the file properties – Delete a file and how do you get to ‘Properties’. Control of the number or extent/age of copies to keep is a broad brush – 3 months for all? Don’t worry about the last 2 – the files are open to anyone with access to the backup drive – no ‘owner’ access control, and only the removable ‘Read-only’ attribute to protect the contents from change. AND – it will happily take backups of files such as your email-store while the email facility is actively updating them – so the backups may not be a cohesive set, or even a usable (App-readable) set. So much that could have been done right – starting with using the 32,000 character filename API and having the backups in a ‘secure’ storage facility. System Image – great idea – but there is only 1 copy – and that gets updated with the new stuff as the update service finds changes – so corrupt files will be put into the ‘image’ inplace of earlier not-corrupted files. And the latest versions of the cryptlock type malware will encrypt those backups for you – too! For a safer backup – 2 drives for use alternately – so 1 is detached from the system at all times and can be used to restore files after a system is restored from a malware attack or motherboard failure that took the attached backup drive as well as the main internal drive. And – your personal data files – as in the stuff you typed-in – save a copy of that to the cloud using an encrypt-it-on-your-PC such as Spideroak – and maybe for the not-so-sensitive stuff OneDdrive or Dropbox and – a micro-SD or small USB stick. TODO (FREE) for Drive, partition or OS restore – with it’s file options. BUT create the booting – stand-alone restore facility CD’s or USB sticks. Yes – FileHistory is nice – but not to be relied on and definitely NOT on a shared system. 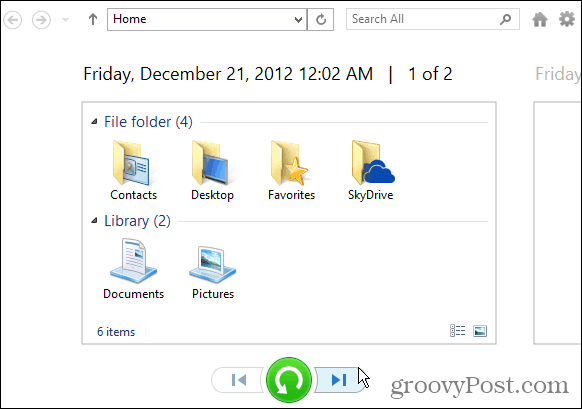 Daily – or weekly backup sets of your data files that you’ve collected – webpages, music etc. From your favorite recommendation I decided to give CrashPlan a try. So far it seems great. Very simple and understandable user interface. I’m backing up to an old ex-desktop hard drive (externally) for this initial experiment. I’m on a laptop at present. Once it’s finished with the initial backup and things work out the way I expect I will probably switch to a large external drive. However, I’m not a believer in continuous back up and will attempt to do the backing up about once a week to see how it works out. I use Carbonite on another desktop here in the household and it will be interesting to see how the two applications compare with each other. Previous experience has taught me not to rely too heavily on system restore or image backup, though at times they have been handy. All I back up is My Documents, Pictures, Videos, Music, and the Application Data folders – Local, Local Low, Roaming, and Program Data. To do that I use SyncFolders or Karen’s Replicator, which can be downloaded from MajorGeeks or SnapFiles. Twice a month, I back up My Documents, Pictures, Videos, Music to 2 different hard drives. Yes – 2 drives in the same place as the PC – and house contents destroyed, or electrical stuff taken away by a (nocturnal?) visitor! The 2 drives in-house are to deal with system problems that result in corruption of the backup drive. That’s why I use (encrypted) cloud storage for what I typed in, and the irreplaceable – with commiserations for those with masses of personal photo’s. Considering the rest of the stuff, I would probably need to get new PC – so that would be a massive re-download after setting up the new OS. The bujilt-in image does not seem to work any more with Win 10 on Boot Camp (Mac machines running windows). Acronis specifically won’t work on Boot Camp any longer, instead insisting to be run under the Mac side, and needs to back up ALL drives and partitions at once. (A real pain if you ever want to migrate your Boot Camped Windows to an actual separate PC). There is a thing called Win Clone, but Microsoft ensured that no longer works by disallowing support for hard drives to be in a format that macOS and Windows can both write to (ExFat, I think). I don’t want to depend on a constant-backup system, and I only want to use the internet to store backup FILES (where I control the imaging process). Anyone know the best way to create a Windows image or Windows copy from a Mac Boot Camp partition if the built-in Windows 10 imaging won’t work? My this has gotten past ridiculous. OK maintenance to stay within the ‘free’ space is a minor annoyance – but better than – well you didn’t want the file – so we deleted the backups 4 U ! Once the backups are refreshed – you can just stop the facility until you next want it to run. Sync – – well login with your id and password from a new PC, and then tell that PC the encryption key so it can decrypt the downloaded files. Optionally – it can ‘remember’ the key – depends on your ‘security’ wishes. You will need to consider the fullfilename limitations, and the character set. And – 4 the optometric – well shortsited? – there is always the free Microsoft Onedrive! Seems to me that all of us are sharing the One drive! I am confused. Backup and Restore (Win 10) will save files in my libraries and make a system image, but it will not back up my programs. Will the system image include the registry keys for what I have already installed? If I have to use the USB recovery drive to load restore the drive when it fails, that USB drive already includes a clean install of Windows (the WIM). What benefit am I getting doing the backups? 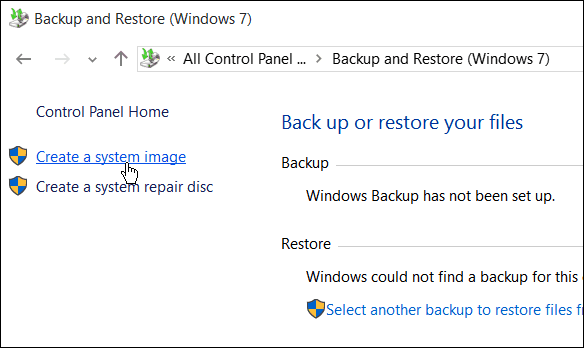 My belief is that Microsoft backup facilities provided within Windows should NOT be considered reliable as a backup to allow you (or anyone) to recreate their system iafter many o the possible, and probable system problems that would make you need to restore or recreate a system. As I have posted earlier – there are currently versions of crypto-malware will make the content of all the connected drives unusable. File-History cannot be relied on to save all files. Restore points require a running version of the system to reset. System Image – may (or may not) be a current version of the system – but that is the system – and you should expect it to be either not up-to-date, or a backup of the not working anymore OS’s fileset. Consider them as first stage possibilities for getting a minor problem sorted – such as missing files, or a fall-back facility to get a working system back to an earlier stage. And the USB recovery drive facility will (if you are lucky) help you start to get your system back to the state when you took that backup. So – first option – have a backup of the old drive (or at least the boot (‘system’) and OS partitions, and a facility to install that onto the new system (a second drive? or split the existing partition) and – having copied the old system onto the new drive – you will have to modify the copy created so that the windows on that will run on the new motherboard and CPU. Easeus – Paragon, and others provide such a facility – usually known as a ‘PE; restore – or, with an appropriate PC and OS – maybe run the restored system as a virtual system. Special offers, giveawayoftheday etc. – well, you’ll probably have to pay for current licences for the current versions of that software. Frequently software will convert files from the prior versions format and structure, but NOT from any older version – so those backups you created with version 00.1 through to – say 07? of a facility may well not be usable under version 10 – and you’ll need to have something running 08 to read the 07 file version in order to get a version of the data file that the current version 10 will read. That’s where you find that version 8 will only run under windows 2000 or windows XP – and you cannot get those OS’s anymore! OK – you had upgraded your system from 3 to 95 to 98 to 2000 to XP to 7 and then to 10, so you could run the software in legacy mode – well, that’s very unlikely to happen with your newly purchased windows-10 system. Incremental backups of the OS – whenever you are about to install new stuff – or have fixes. I have to try to recover a load of photographs from an old PC – where the pictures are not on a working camera either – Well, OK they may be on the camera but that was taken along with the new laptop where the photos were stored. Yes – those from the last few years are gone!